The origins of Wheelchair Basketball started in California in 1945 as rehabilitation technique for injured servicemen. 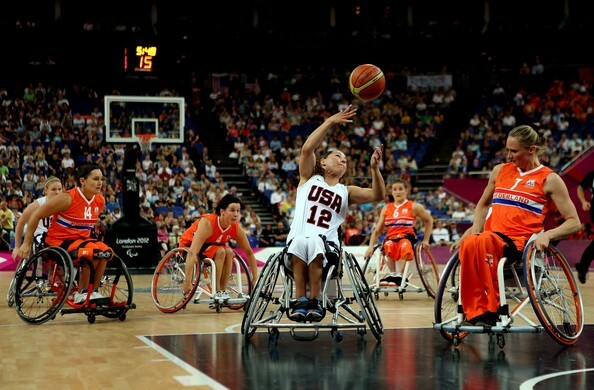 Since the first national USA championships in 1949, Wheelchair Basketball has grown internationally with 12 countries sending male teams to the 2016 Rio Paralympics, and 10 countries sending female teams. Apart from the international aspect of the sport, Wheelchair Basketball can also be played at national level whereby teams around a country can play against each other, most of the time playing in leagues. Wheelchair Basketball is open to all individuals with a physical impairment. While there is no specific classification for individuals with Cerebral Palsy, the classification system is designed to recognise individuals’ functional abilities and make sure that they are not put at a disadvantage. Wheelchair Basketball classifiers will classed people according to their functional ability to do different wheelchair basketball skills and techniques such as reaching forward to grab the ball, pushing the wheelchair and using the core to help balance the wheelchair when at risk of tipping forwards, sideways or backwards. As a result, individuals will get a classification score between 1 and 4.5 on their ability to do these skills and techniques, whereby coaches have to pick their team where all the players’ classification scores adds up to a score of 14.